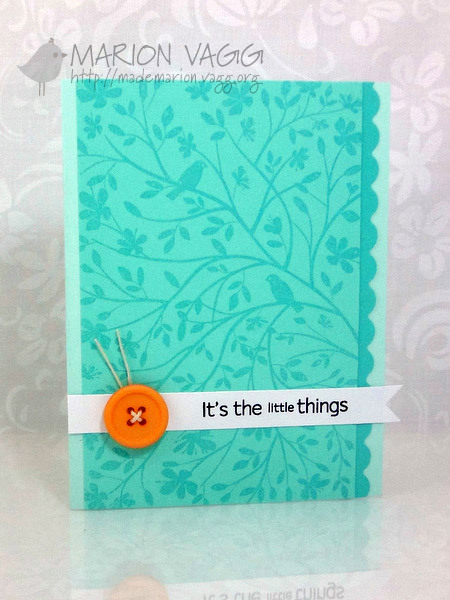 The challenge at AnnaBelle Stamps this week is a sketch challenge. Why not take the plunge and come and join us? I decided to flip the sketch on its side and came up with this. In place of a sentiment, I added a butterfly – so I can use this for any occasion. The technique I used is called trapped embossed resist. 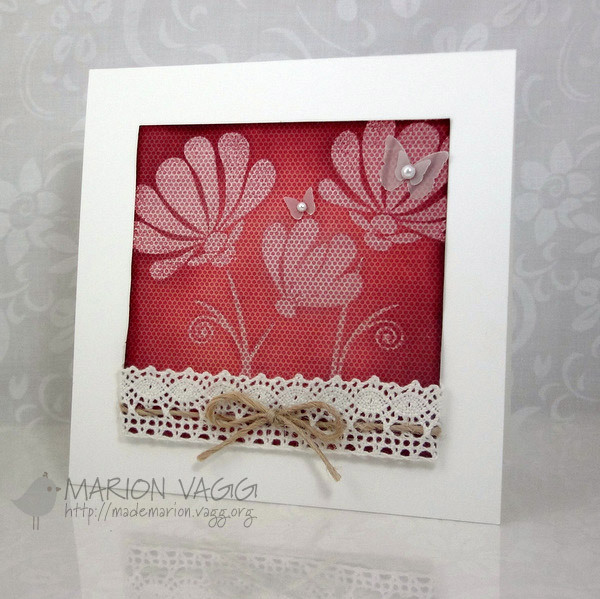 I stamped and clear heat embossed Fanciful Flowers onto some patterned paper from My Mind’s Eye. (Yes you read that right, I used some patterned paper!) 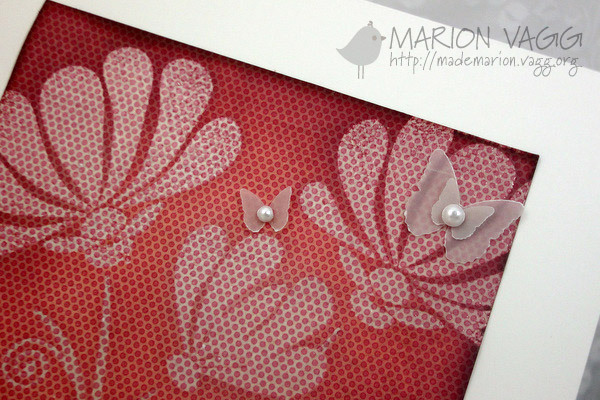 I then went over the stamped images with distress inks – the clear embossed flowers resisted the ink, trapping the patterned paper behind the clear embossing. It was fun to get all “technique-y!” I am entering this into the Simon Says Stamp Presents a Patterned Paper Challenge over at Lilypad cards. And while I was at it, I decided to make a blue one as well. The patterned paper didn’t show through as well, but it is there – if you squint!! Thanks for stopping by and be sure to check out what the rest of the DT have created. The Belles’ links are on my side bar. 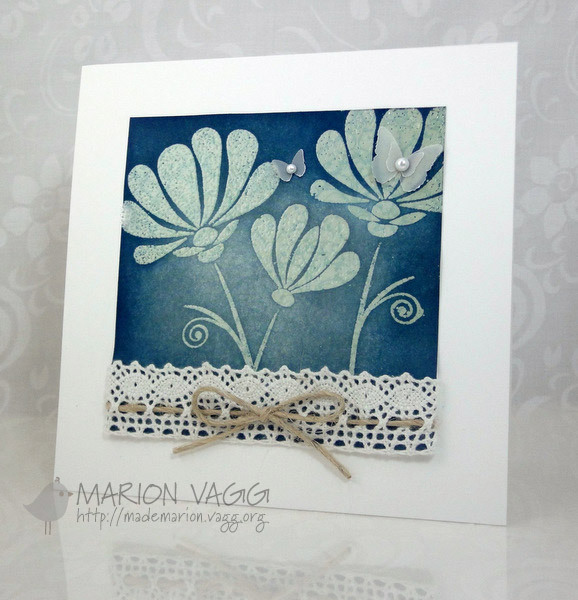 Just sharing quickly a card that I made on the weekend using some new (to me) Hero Arts stamps that I purchased recently. 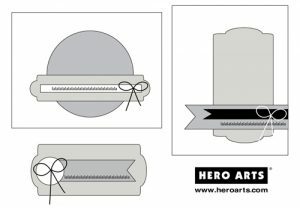 I love Hero Arts pool note cards and that background stamp called Birds and Branches! And thanks to Jess for my button! It was the perfect contrasting colour. I think I may make a set of these in different colours. I am entering this into the Hero Arts Feb competition. My card fits into 2 categories – it is a friendship card and is a liberal interpretation of the sketch on the right. 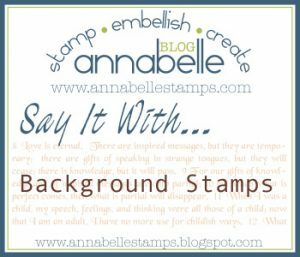 The challenge at AnnaBelle Stamps this week is to use background stamps. Hope you can join in the fun and we look forward to seeing where your imagination takes you! 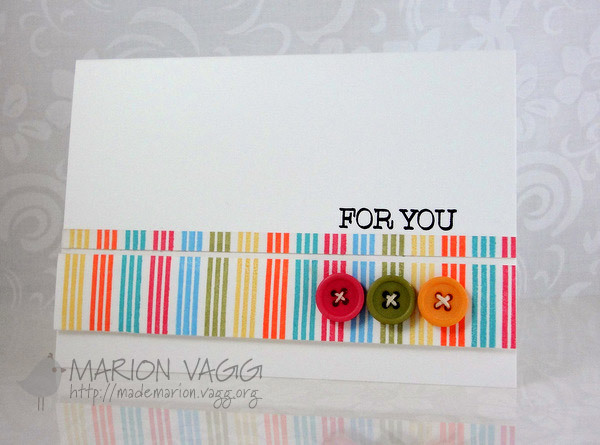 I used BBD#7 to create a colourful stripy background. The buttons were a lovely gift from my fellow DT Jess. 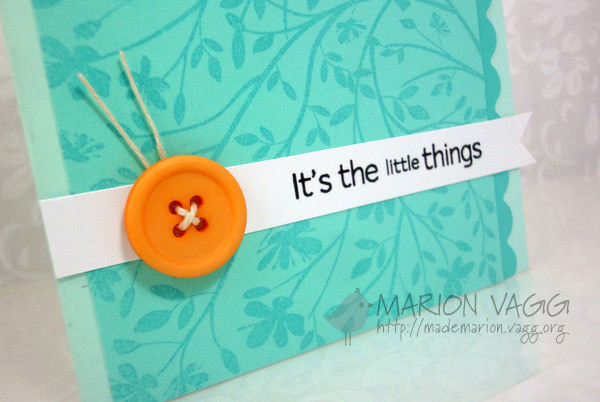 I wanted the sentiment to be a little bolder – so I stamped it once and then stamped it again a fraction to the side, then filled the gaps in with a black felt pen. I am entering this into the current Jay Gee Nook’s Challenge #16 where the inspiration was this photo. 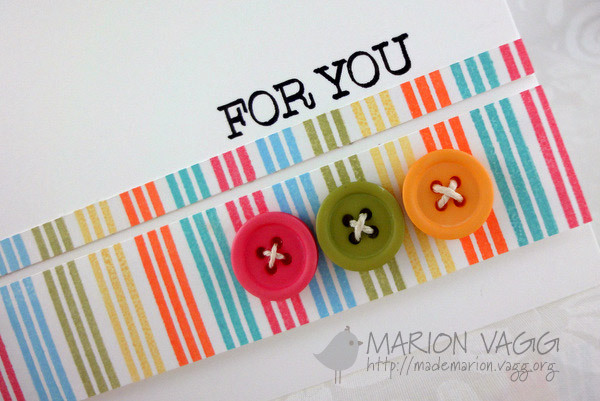 I was drawn to the colours and the buttons! 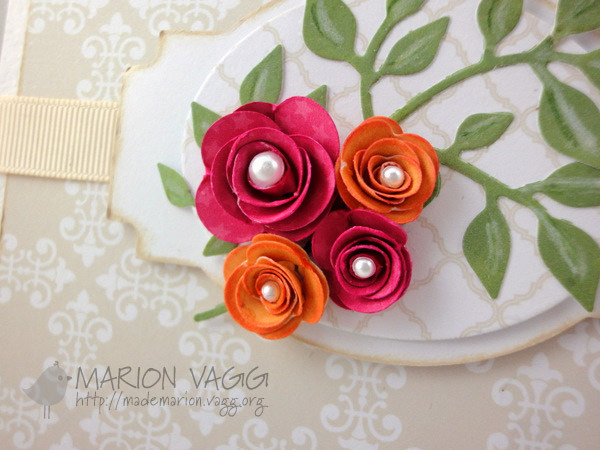 Welcome to this month’s blog hop at Print Candee. You should have arrived from Jocelyn’s blog – but if not, hop on over the the Print Candee blog and start the hop from there. 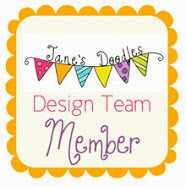 This month we are welcoming a new DT member and that is the talented Lisa Arana. 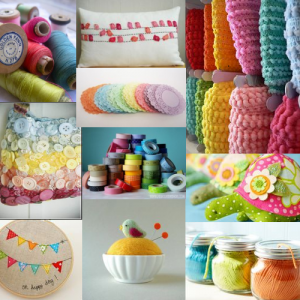 There will be 2 prizes hidden on the Print Candee Creative Team posts for the blog hop. By leaving comments on each stop of the blog hop you will increase your chances to win some great prizes – either a $10 gift certificate to Print Candee store or a set of Spellbinders Shapeabilities Nested Pennants. To be eligible to win you have until 11:59pm EST on Saturday, February 18th to comment. The winners will be posted on the Print Candee blog. This month the Creative Team are whipping up some projects with the the theme of ‘die cuts’. I am sure most of us have a die or two somewhere in our stash. I pulled out 3 dies and got to work with some awesome digital papers from the store and came up with this. 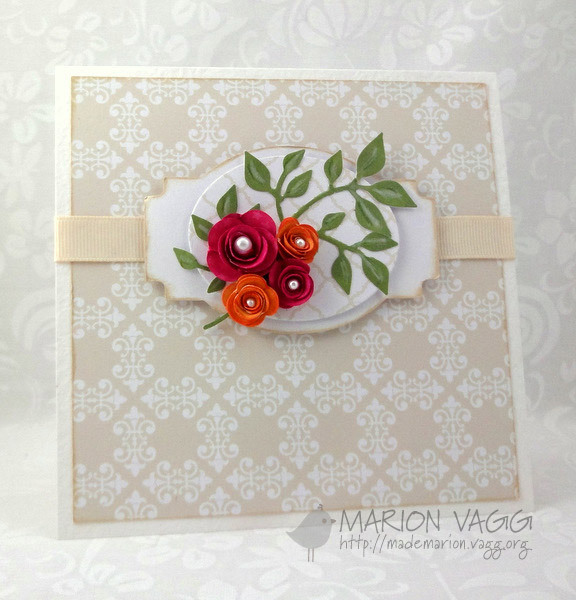 The background paper is from a paper pack called Chai Latte Damasks (Digital Potpourri) – so yummy! The flowers and leaves were die cut from the Owlicious – Happy colors (Print Candee) paper pack. They were actually scraps I had left over from this project – I printed on both sides of the card stock. I added some detail to the leaves with prismacolor pencils. Other Supplies: Die-Namics Layered Label Die, Die-Namics Rolled Roses, Sizzix Flowers, Branches and Leaves set, AnnaBelle Stamps pearls, Cuttlebug, foam dimensionals, Kaisercraft grosgrain ribbon, Prismacolor pencils, Glossy Accents (to adhere flowers, leaves and pearls). Thanks for stopping by. Now you are heading over to the Print Candee Blog. 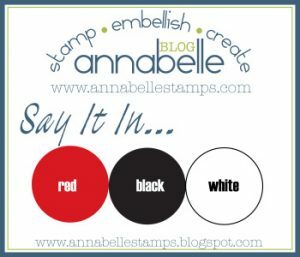 This week at AnnaBelle Stamps is a colour challenge…and a fun one at that! Red, black and white. Hope you can play along. 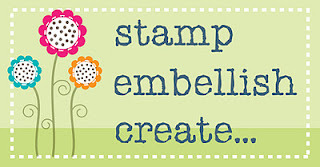 Oh and have you checked out the new Stamp, Embellish, Create Ning site?What is it you ask? Check out all the detail here. 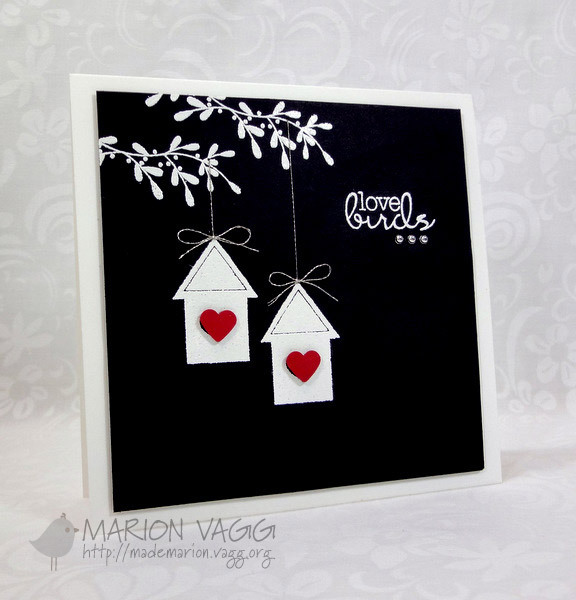 Sign up and join this new on-line stamping community….it’s free! Thanks for stopping by and be sure to check out what the rest of the DT have created. The Belles’ links are on my side bar. Hope you can join us this week.